Once we had the wheels and tires lined up for our Jeep build, I realized two things: 1. There was no way I was putting the factory chrome lugs on the new wheels and 2. I sure as heck better find a good way to lock those valuable wheels/tires onto the Jeep. I came across McGard, an Orchard Park, NY based company that specializes in innovative security products for the automotive, marine, utility, oil field and telecommunications industries. Their motto is “Life is tough, you need nuts to match”. I already knew that, but they were talking about lug nuts for your wheels. 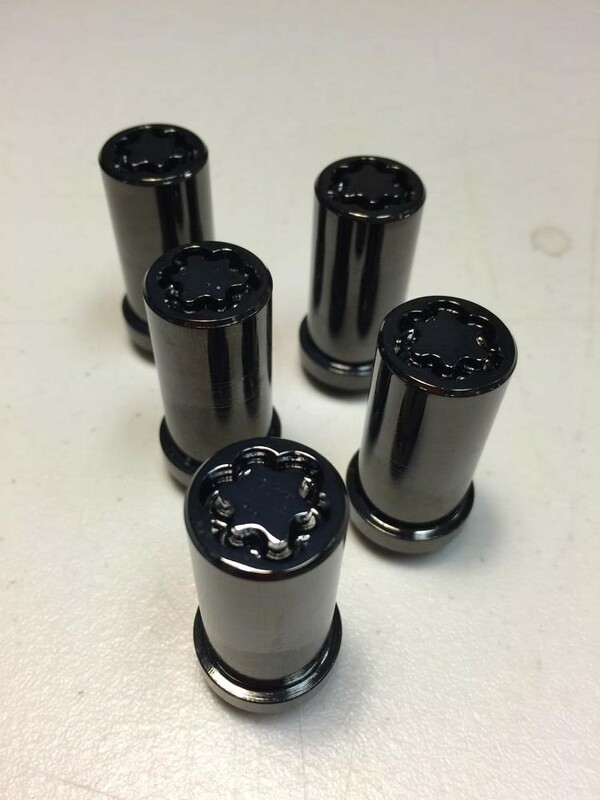 In any event, I found that they produce black chrome lug nuts with locking features; just what I needed. 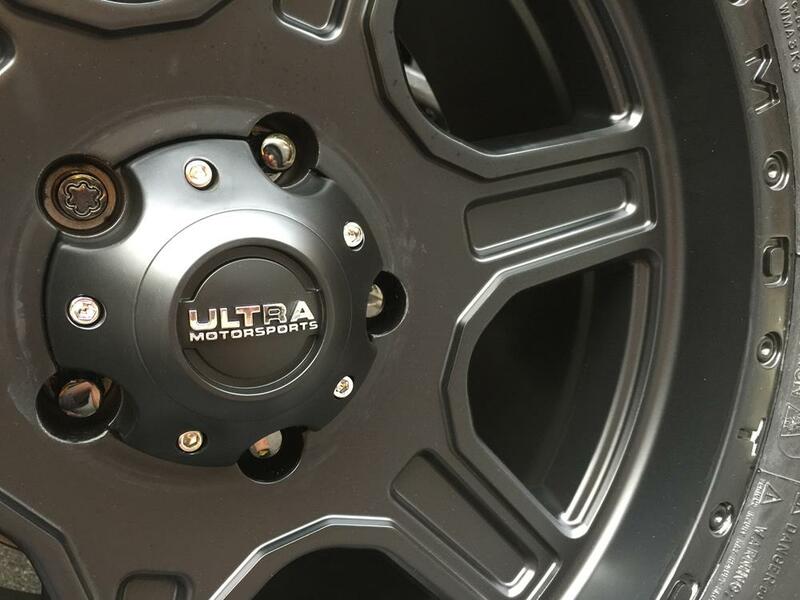 A very helpful call to the company to confirm type/sizing of lug nuts to match up with the Ultra Motorsports Vagabond wheels and I was ready to go. We are very thankful that McGard offered to sponsor our SEMA build. 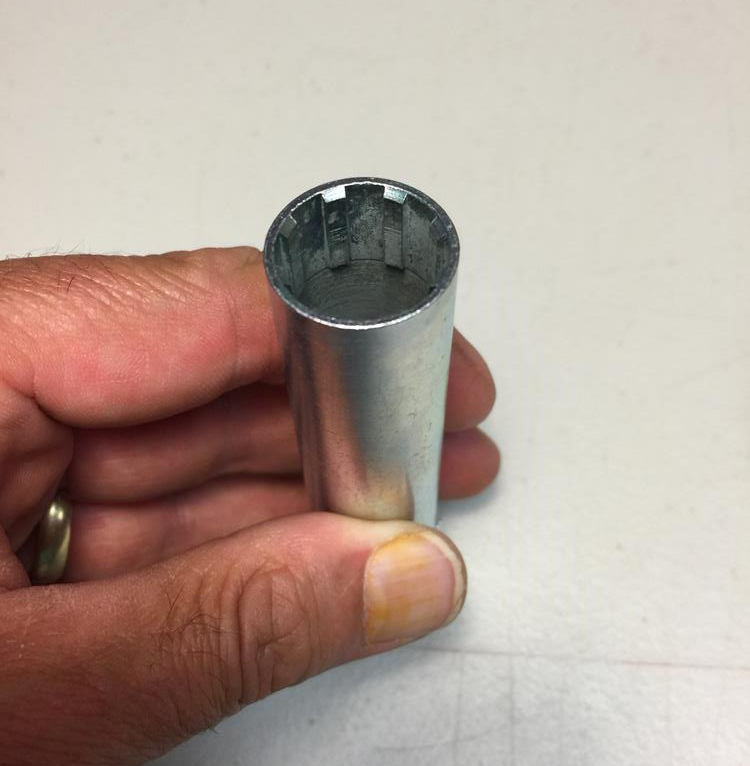 The McGard website is extremely informative and even shows wear testing of McGard lug nuts vs other lug nuts. In this photo, the McGard lug nuts are the two in the center, flanked by (4) competitive brands’ lug nuts (shown after 5 years of life). My wheels required “Cone Seat” lug nuts which means the nuts have a 60 degree tapered bottom. McGard sent the 65562BK install kit which includes spline drive lug nuts, wheel locks, an lug nut install tool, a wheel lock tool, a storage pouch for both tools, chrome valve stems, and an ID card. McGard also sent extra lug nuts and a wheel lock for my spare tire and an extra lug nut install tool and wheel lock tool (conveniently number-coded if replacement is ever needed). I highly recommend taking the precaution of having one set of tools in the vehicle and a second set of tools at home. No matter what, these type of tools seem to grow legs and run away. I was interested to learn about the advantages of spline drive lug nuts. The spline drive design allows for deeper stud engagement, greater torquing power during installation and removal, and a larger seating surface. 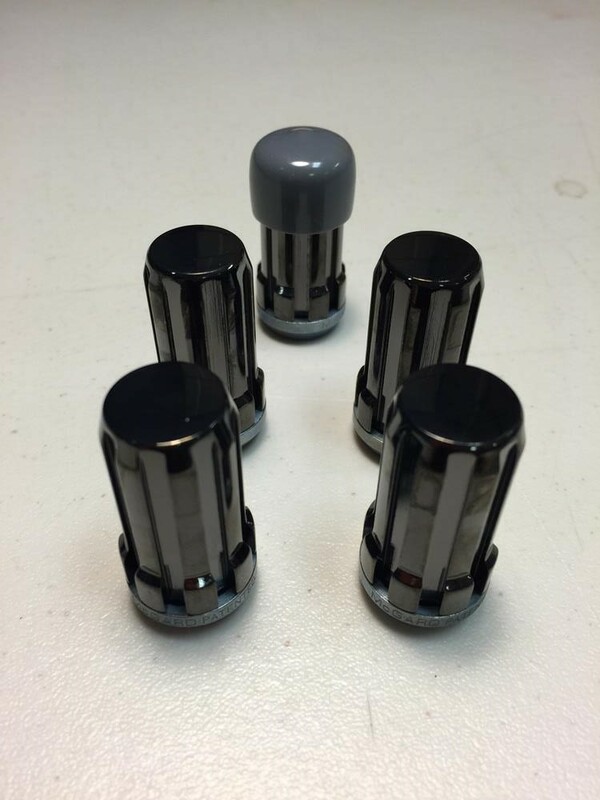 The first thing you notice about the McGard lug nuts is their extreme light weight. The next thing, their depth of color. All nuts and locks came with protective caps. 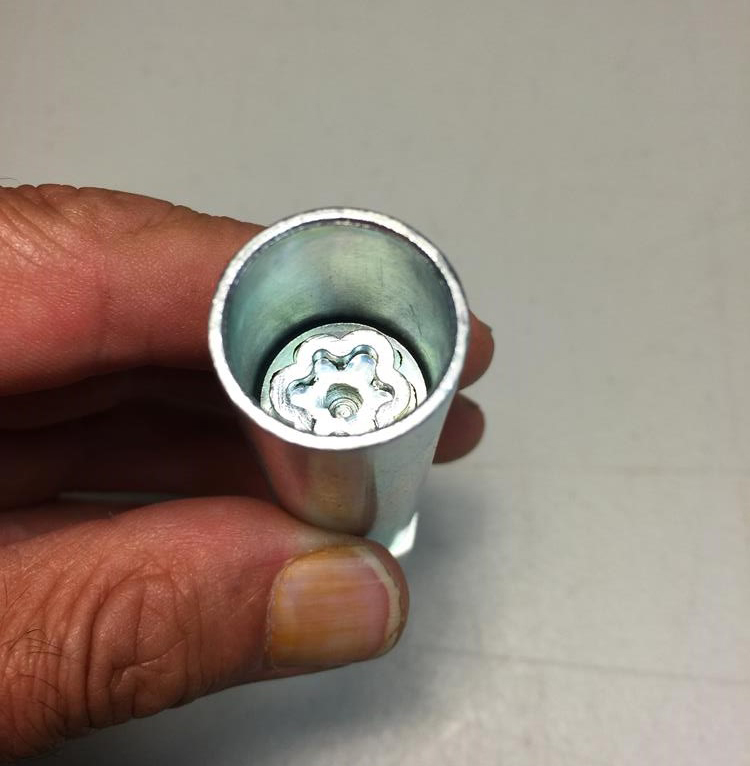 Here is the spline drive lug nut install tool. …and the wheel lock tool. The lug nuts were a perfect match for my wheels. We were able to make the lug nut swap as the aftermarket wheels and tires were being installed at Discount Tire. The folks at McGard were great to work with and really know their stuff!